Last night's Blazer game against the New Jersey Nets didn't start off so well. We fought back from a slow start and were a few points down at halftime. But then trailed by 11 midway through the third quarter. We needed someone to step up and assist Roy and Aldridge who were already giving it what they had. 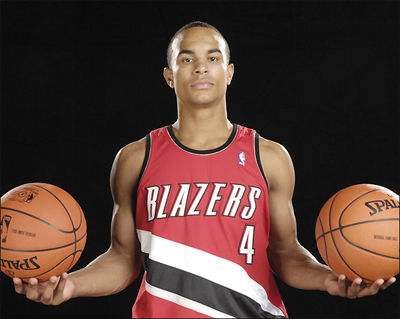 Coach Nate called upon Jerryd Bayless to play point, and get to work. He got it done with strong drives to hoop, buttery smooth jumpers, and one hell of a floating two handed dunk! 6 for 9 shooting and 11 perfect trips to the free-throw line added up to a career high 23 points. Great job J.B. and welcome to Portland.